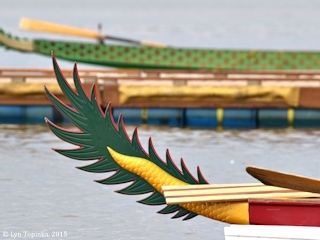 "Dragon Boats, Vancouver Lake, Washington"
Click image to enlarge Dragon Boats, Vancouver Lake, Washington. Image taken August 2, 2015. 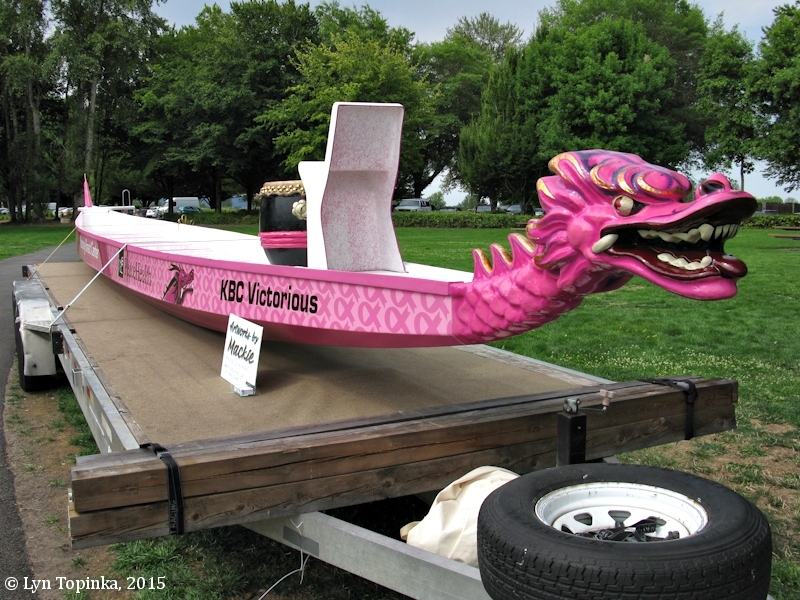 "The Pacific Dragon Boat Association (PDBA), the governing body for dragon boat racing in the Western United States is pleased to announce the selection of Vancouver, WA as the site of the 2015 PDBA Western Region Dragon Boat Racing Championships. Double Fifth Dragon Boating of Vancouver, WA will host the event, which is scheduled for August 1st and 2nd, 2015. 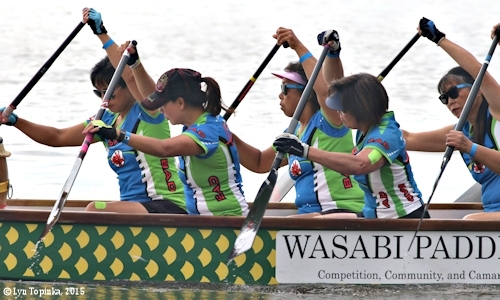 Double Fifth is a Vancouver based professional dragon boat race management company and one of the largest retailers of dragon boat equipment in the world. 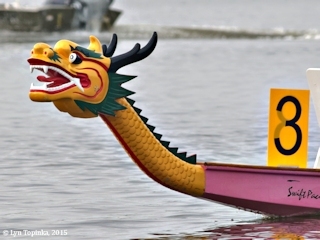 The PDBA Championships are held every two years in preparation for the International Dragon Boat Federation (IDBF) World Championships. This regatta will select regional representative teams to represent the United States at 2016 World Championship in Adelaide, Australia. Elite club teams train year round to prepare for this world class event. This year, in addition to the elite crews attempting to qualify for Adelaide, Corporate, Community and Recreational Teams will compete against each other in Paddle West Championship for the West Coast. 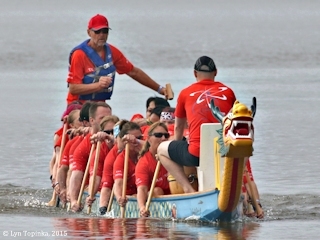 These added divisions allow all dragon boat teams a chance to compete against crews of similar ability. Club teams will compete in the following racing divisions: Premier (the elite division with no age restrictions), Masters (40 and over), Grand Masters (50 and over), U-24 (College teams) and Juniors (under 18). 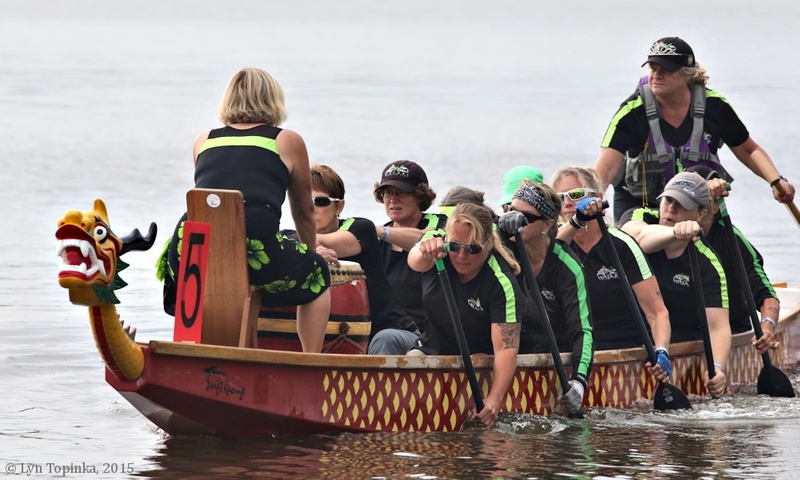 Within each division there are three racing classes: Open (no gender restrictions), Women (all female crew), Mixed (minimum of 8, maximum of 12 women) and a Breast Cancer Survivor division. The 2015 championship winners will be eligible to represent the United States at the IDBF World Club Crew Championships in Australia in the fall of 2016. Club teams that are not part of the PDBA will compete for Best in the West bragging rights. 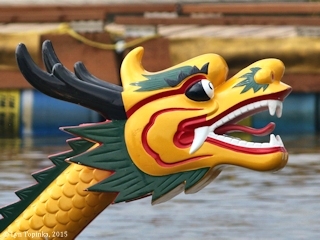 Dragon boating traces its roots back over 2,300 years to China. 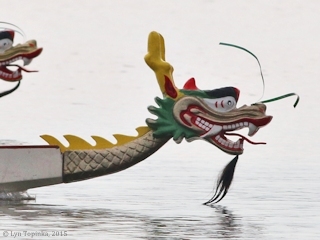 In the Western Region of North America over 6,000 people participate in dragon boating and world-wide over 50 million people, most in Asia, are dragon boat paddlers. Races are straight line sprints over three distances, 1000 meters, 500 meters and 200 meters. 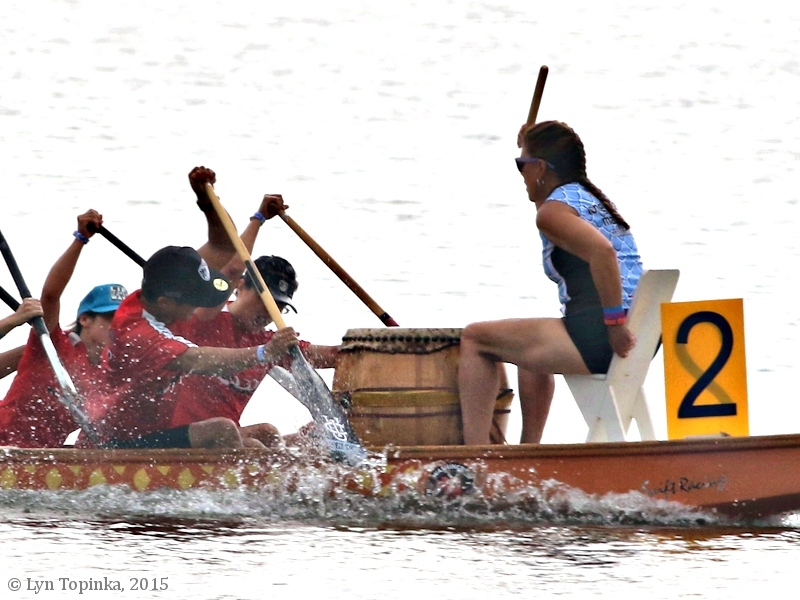 The racing is fast with a top crew completing the 200m course in under 45 seconds. That may not seem fast until you consider the weight. 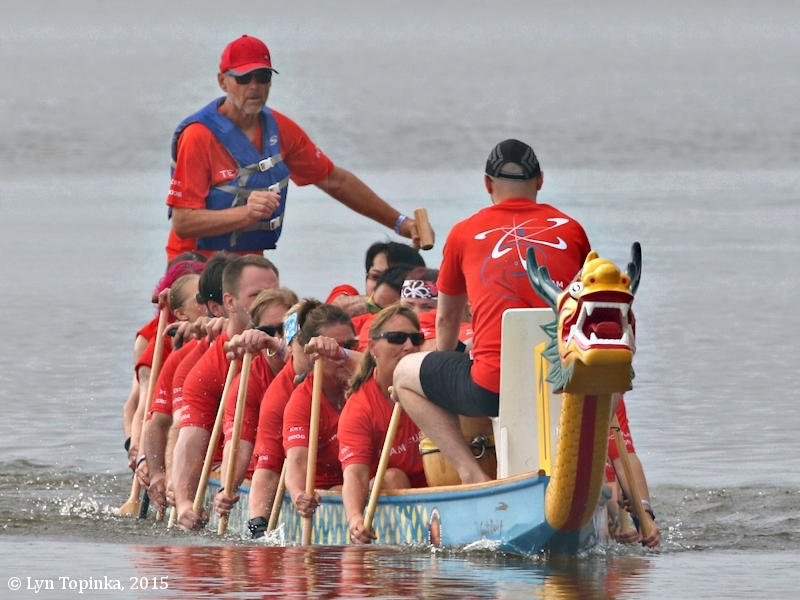 A fully loaded dragon boat carries a load approaching two tons! Vancouver Lake was chosen for several reasons. 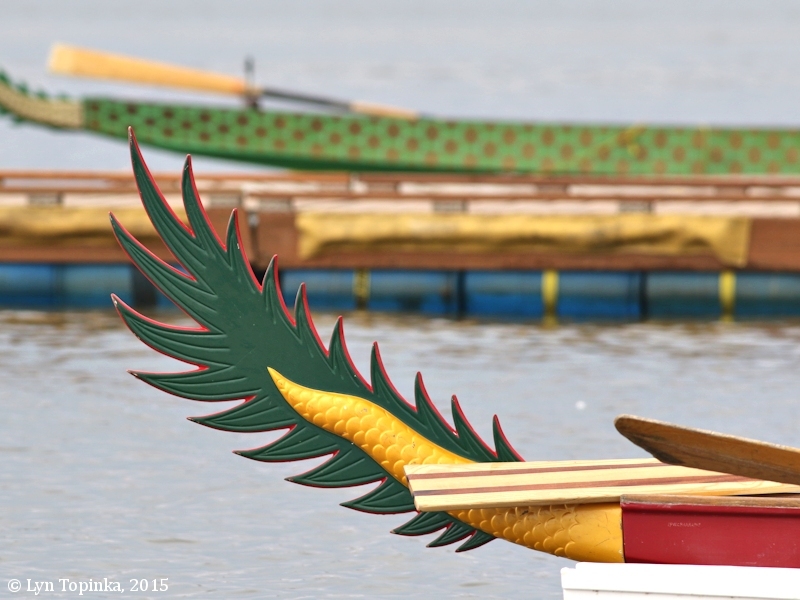 The lake has a championship regatta course that hosts numerous regional rowing championships. Vancouver Lake Park is a beautiful setting just a few miles from downtown Vancouver. The city is easily accessible by car or air and reasonable hotel rates makes it economical. Most of all the city and county are enthusiastically supporting the event." 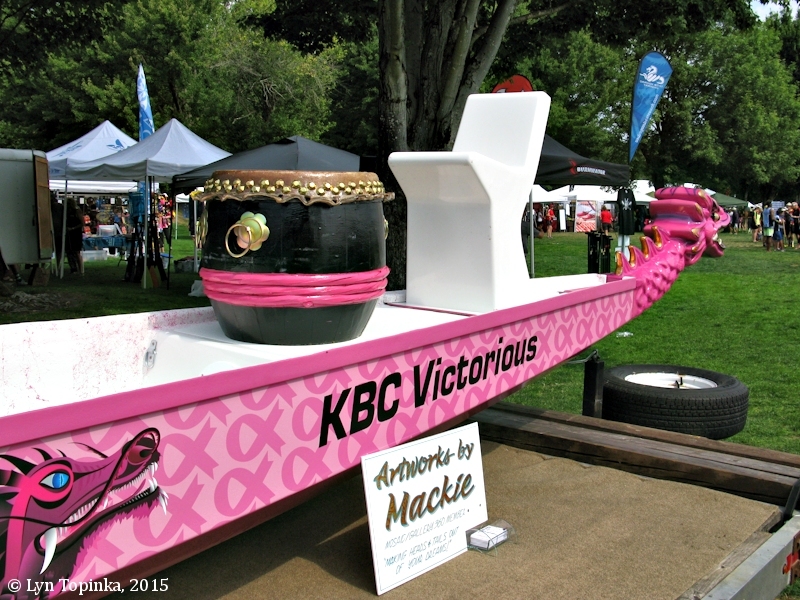 Source: Pacific Dragon Boat Association website, 2015. 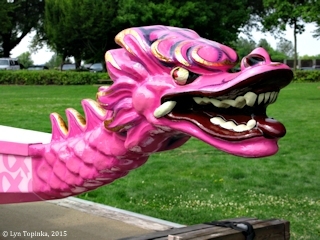 Click image to enlarge Dragon Boat, Vancouver Lake, Washington. Image taken August 2, 2015. Click image to enlarge Tail, Dragon Boat, Vancouver Lake, Washington. Image taken August 2, 2015. Click image to enlarge Kearney Breast Center Dragon Boat, Vancouver Lake, Washington. Image taken August 2, 2015. Click image to enlarge Loading, Dragon Boat races, Vancouver Lake, Washington. Image taken August 2, 2015. 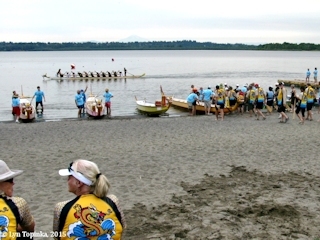 Click image to enlarge Racers, Dragon Boat races, Vancouver Lake, Washington. Image taken August 2, 2015. 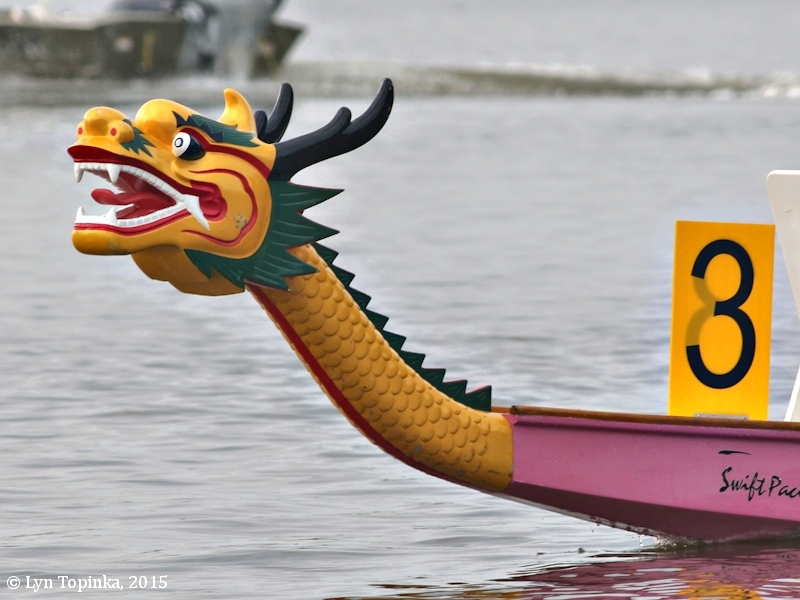 Click image to enlarge Wasabi Paddlers, Dragon Boat races, Vancouver Lake, Washington. Image taken August 2, 2015. Click image to enlarge Long Beach Masters, Dragon Boat races, Vancouver Lake, Washington. Image taken August 2, 2015. 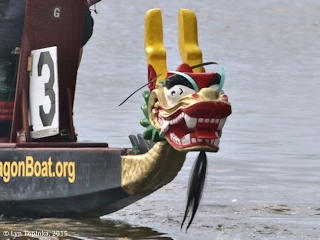 Click image to enlarge Team Fusion, Dragon Boat races, Vancouver Lake, Washington. Image taken August 2, 2015. 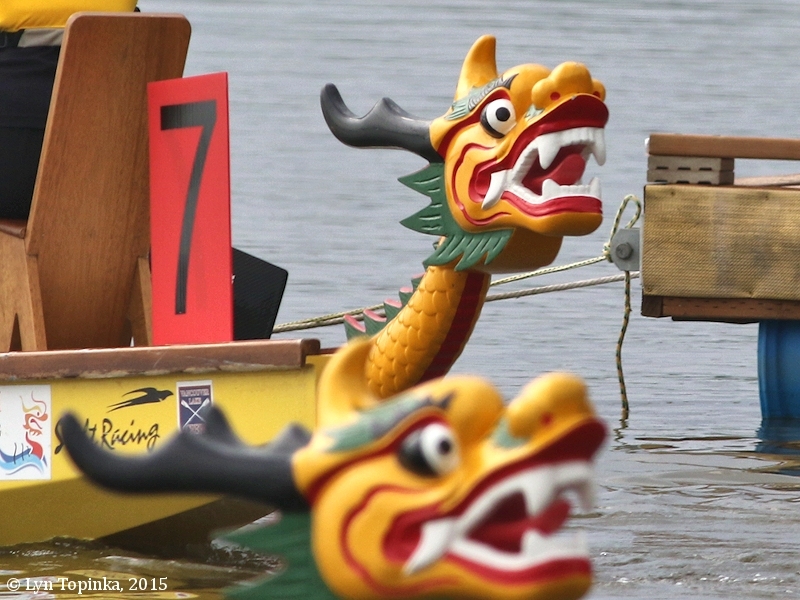 Click image to enlarge Racing, Dragon Boat races, Vancouver Lake, Washington. Image taken August 2, 2015. 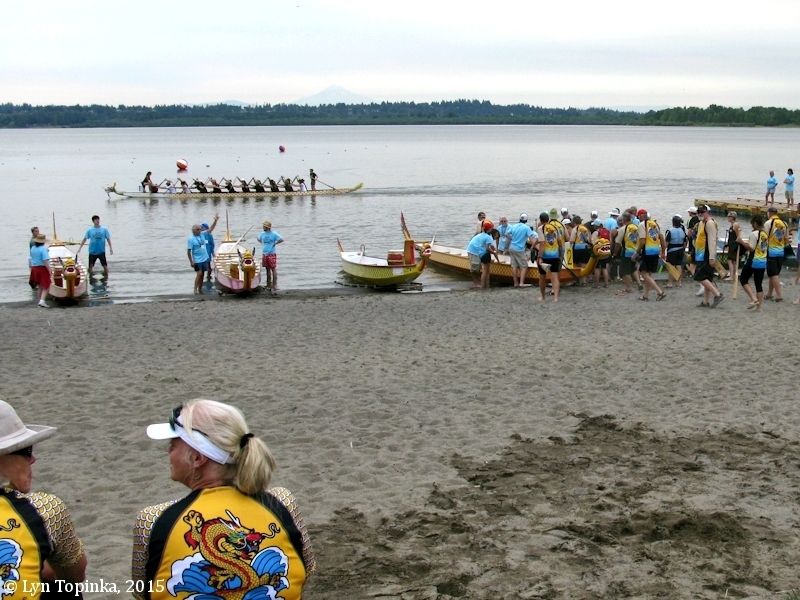 Click image to enlarge Finish line, Dragon Boat races, Vancouver Lake, Washington. Image taken August 2, 2015.